NEW Multicolor Remote-Controlled Footwell LED Kit! Easy install, everything included! Looking to add a fresh look to your interior? Footwell LEDs are the way to do it! By adding bright LED strips under your dash, you can add a lot to the look of your vehicle. Any questions, feel free to ask via email ([email protected]), Post or shoot us a PM! Last edited by Diode Dynamics; 08-08-2013 at 12:12 PM. Can these be fitted to the back seats as well? Trunk/Hatch? Yes, if you select the rear footwell option, it comes with two 10-foot RGB extension wires and two additional RGB strips, to be placed either in the hatch or in your rear footwells. can't wait to order mine. On a side note...any word on a new antenna that I can buy from you guys. Not a replacement, just want some like you sold in the past. Thanks! We no longer sell any type of antennas. Is it hard to install it? Installation is fairly simple and straight forward. We have plenty of resources to help and you can always contact us at (314) 205-3033 for more support. Let me know if you need more in-depth tips, shoot me a PM. Do you guys have anything like this? Defiantly looking at picking this up... Your detailed installation guide was the selling point. Congratulations to Wally this month's Car of the Month winner! Just ordered Multicolor AEs, Red footwell kit, full red conversion kit, and full red and black acrylic kit from you guys. Hope everything turns out good . Looks pretty cool ,I already have your multicolour Angel eyes Kit, Might buy this Kit too and The Multicolour fog Lights Also ! I'll have a rainbow in My tib lol ! I've always enjoyed your product for my tibby but shes been gone for quite some time ="( Paul is an awesome guy and helped me with minor issues that was resolved amazingly fast, anyways, i was wondering if this would fit my 2008 nissan altima sedan, i would love to purchase this! 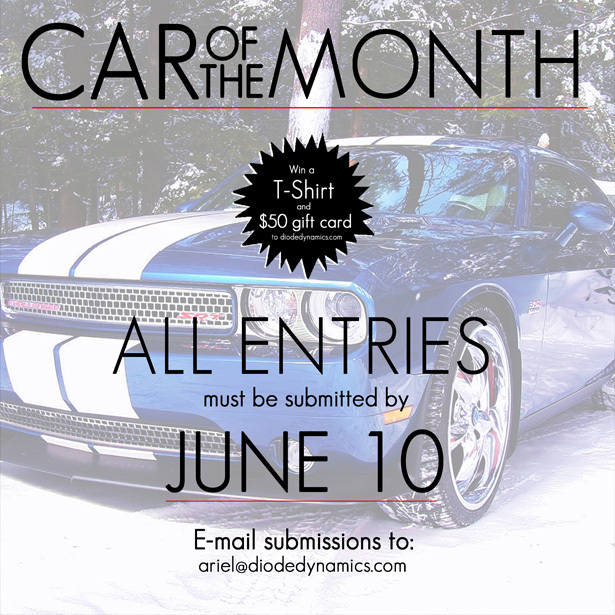 Each month?s winner will be announced in the Diode Dynamics monthly newsletter and on social media outlets. Winner will receive a T-shirt and $50 gift card from Diode Dynamics. **Must have at least ONE Diode Dynamics product on your vehicle. All submissions are subject to approval. By submitting photos, you are giving Diode Dynamics the right to use them for marketing purposes.